TOP Quality. Made in China!!! 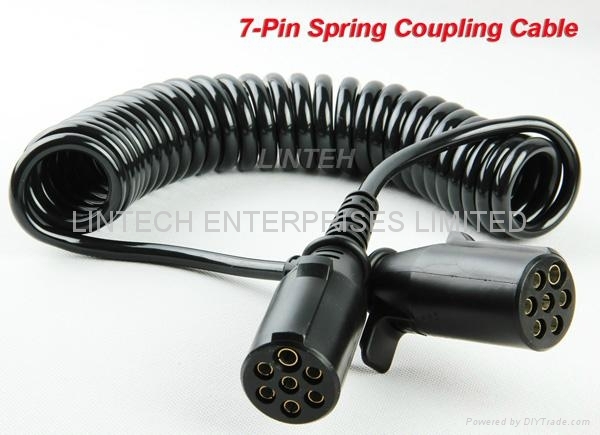 2m spring/curly trailer connecting 7-Contact plug and sockets and cable for one camera on any form of trailer. Robust and tough designed for heavy haulage and farming machinery but sold to many caravaners as it gives a professional finish to your reversing camera system. The trailer spring kit keeps cables waterproof and dust proof and prevents camera malfuction. The curly spring cable is 2m in length. It includes an 8/10m cable that connects from the monitor to the back of your car. A 15m cable that connects from the front of the hitch on the caravan or trailer to the camera at the rear. Trailer Truck Cable 7 Pin Trailer Kit for Heavy Duty Trucks and Commercial Vehicles. 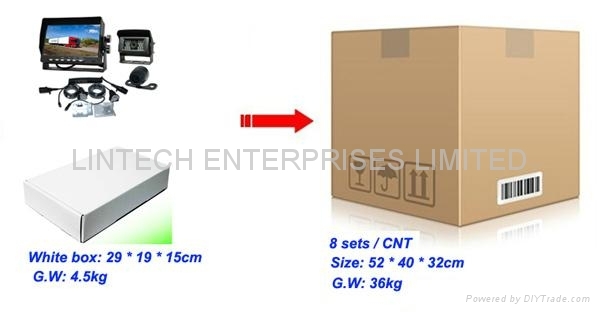 Trailer Kits used for heavy duty and trailer combination. Highly Recommended for Heavy Duty Trucks, Tractors, RVs, Trailers. 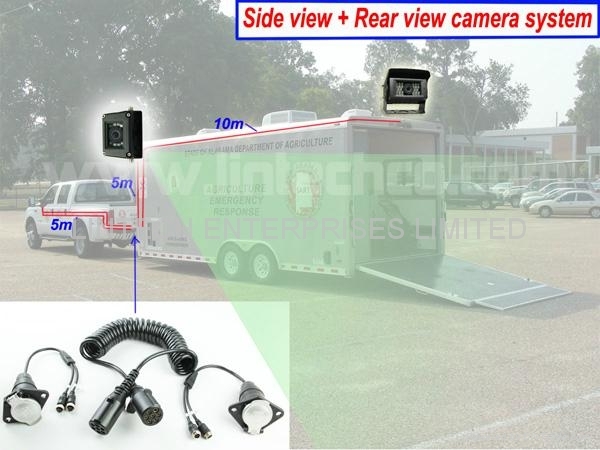 Truck Trailer Backup CAMERA SYSTEMS is a great solution to the poor visibility behind trailers. 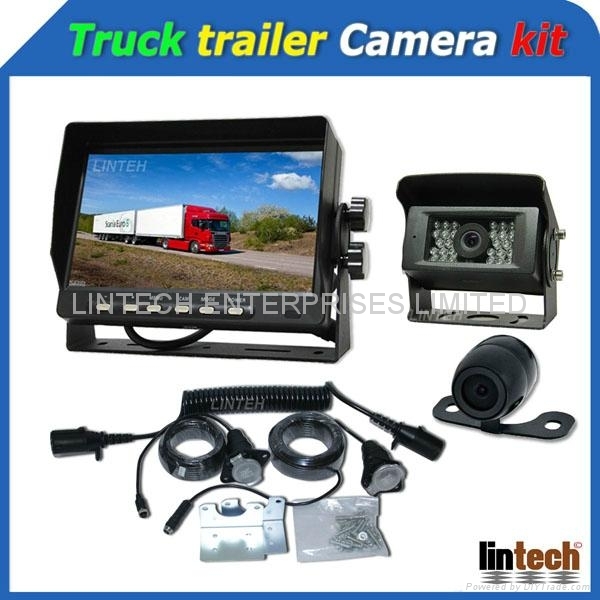 It offers IR high resolution reversing cameras,LCD monitor and control box that controls power and activation. 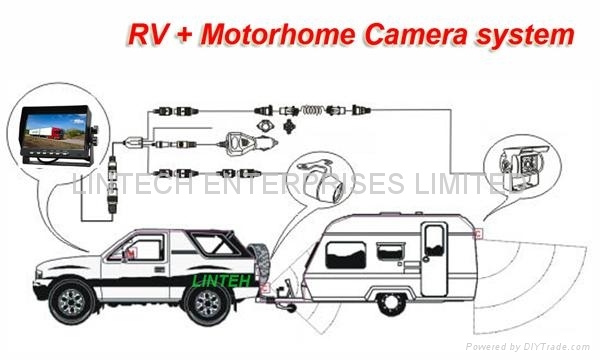 The image on LCD will be automatically changed to the trailer mounted camera whenever the trailer is attached.When the trailer is disconnected the signal will revert to the camera mounted on towing vehicle. (1)7inches new AU TFT-LCD panel. (11)Video signal disappear, display blue screen. (13)Operating temperature: -20 ~ +50 degrees. (14)Storage temperature: -40 ~ +65degrees. (10)Auto heater built in optional (temperature < 5 degree heater start ). 1pc x 10m cable for monitor to tow hitch curly cable(waterproof). 1pc x 1m 7-pin curly cable (waterproof).